Taking time during the reception to create a nighttime image to round out the wedding day coverage is one of my favorite things to do! This image was taken at Eagle Glen Golf Club, using the same gazebo that Kenya + Wasani stood before during their wedding ceremony. 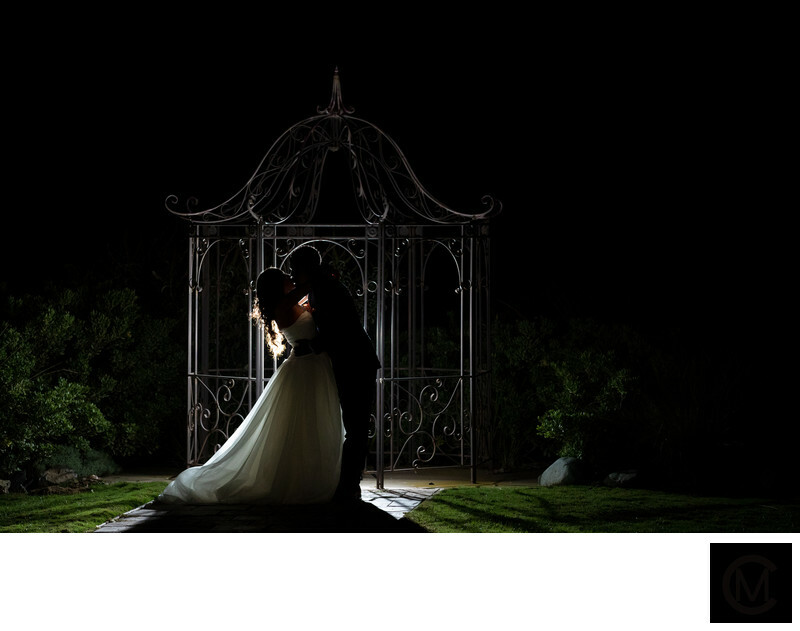 Using an off-camera flash, I was able to back-light the couple and create this silhouette image. With nighttime images, I always ask couples if this is something they'd like to prioritize in their wedding day timeline. Most weddings have a few hours later in the evening which are almost exclusively guest dancing (which I do love to capture!). During that time, my second photographer and I will go outside and scout for a good location, and only once we have our lights set up, will we go in and grab the couple. These types of shots taken no more than five to 10 minutes and I love the drama they had to the final images delivered to the couple. Location: 1800 Eagle Glen Pkwy, Corona, CA 92883.